1. Learning Blocks: Baby can learn the letter and number blocks to improve cognitive abilities. 2. 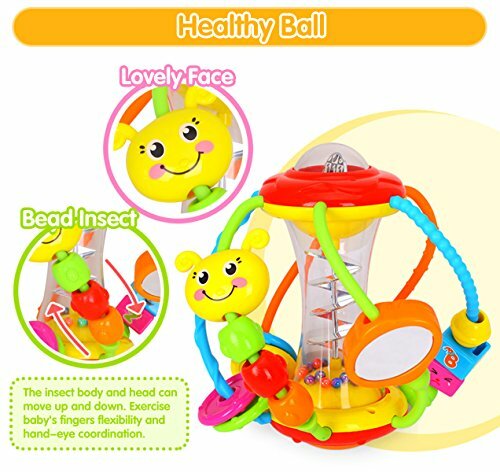 Bead Insect: The insect body and head can move up and down. Exercise baby’s fingers flexibility and hand-eye coordination. 3. 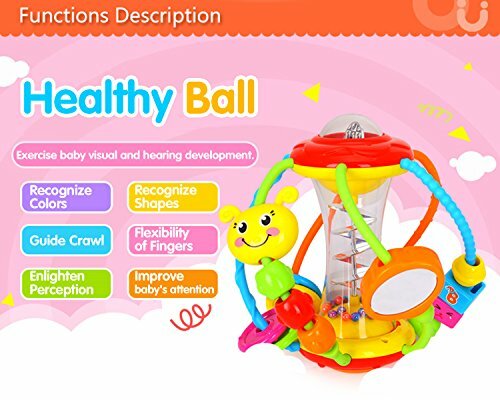 Crystal Ball: Flip healthy ball or turn over the crystal ball, the crystal ball will transform to different patterns to attract baby’s attention. 4. Round Slices: Turn over the ball, the round slices will go down, train baby’s fingers flexibility. 5. 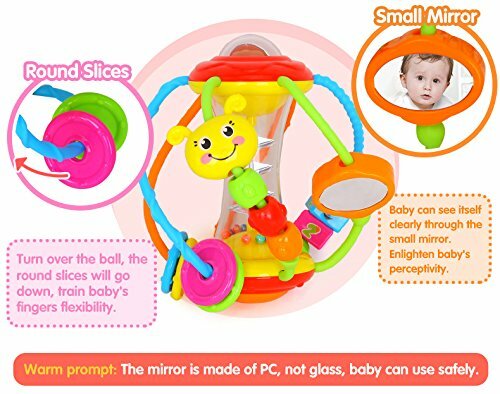 Small Mirror: Baby can see itself clearly through the small mirror. Enlighten baby’s perceptive. The mirror is made of PC, not glass, baby can use safely. 6. 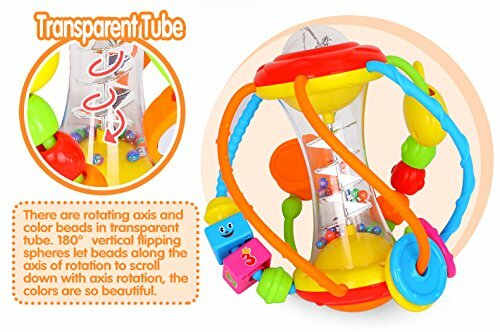 Transparent Tube: There are rotating axis and color beads in transparent tube. 180°vertical flipping spheres let beads along the axis of rotation to scroll down with axis rotation, the colors are so beautiful. 7. Sound Button: Pressing the button, it will emit clear sounds. It can cause baby’s curiosity and interest in playing and stimulate baby’s hearing development. 8. 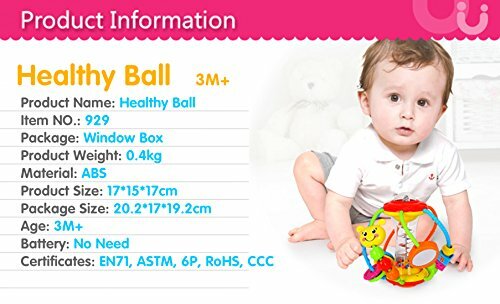 Play Ball: Grabbing the ball, you can shake it, and hear clear sound when small parts hit each other; rolling the ball, you can crawl on the ground with it; up throwing the ball, it will attract baby’s attention and stimulate the baby to move. 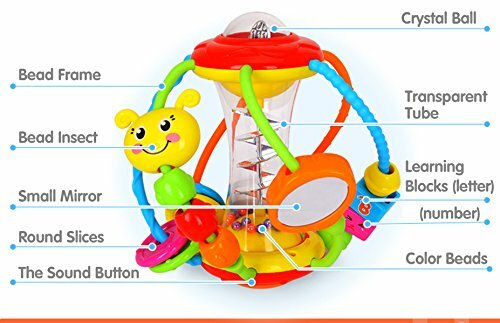 1 x Window BoxHealthy Ball Baby Rattle Learning Activity Toys develop baby’s hand grasping ability, stimulate baby’s auditory, visual development. Cultivate healthy baby. Fine Motor Skills: Exercise baby to grip and shake, and improve the flexibility of fingers and palms. 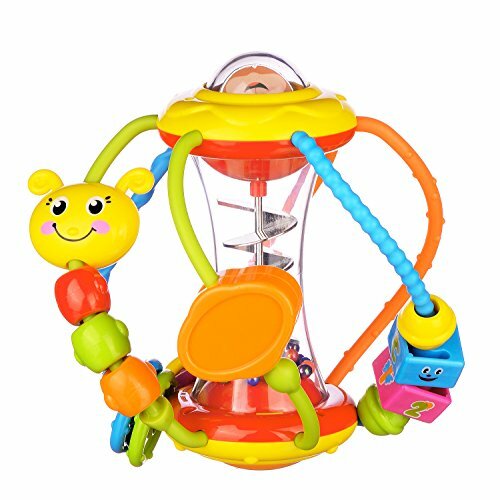 Observation Ability: Various beads and a small mirror on the ball can cultivate baby’s ability to gaze and observe. Visual Development: The colorful healthy ball can stimulate baby’s visual development. 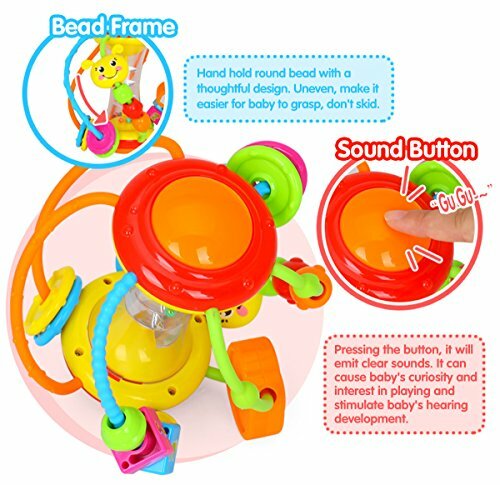 Hearing Development: The collision sound from small beads on the ball can stimulate baby’s hearing development.